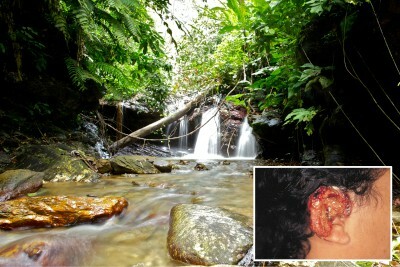 Contact with intact forest ecosystems can lead to cutaneous leishmaniasis, also known as "chiclero's ulcer" (inset). Photo Credit: Photo of forest courtesy of Peter Hudson. Inset image Copyright 1997, 2004 by Current Medicine LLC. All rights reserved. Image reproduced here with kind permission from Springer Science+Business Media B.V.
Conserving nature can improve human lives. From forest watersheds that perform natural filtration of drinking water to coral reefs that break tsunami waves before they flatten seaside villages, intact ecosystems provide innumerable services to human society. Might biodiversity be healthy for the ecosystem and also protect people against infectious diseases? While most disease ecologists would say yes, a new study published in Ecology presents data suggesting that the balance between biodiversity and infectious disease is more complicated. The study was conducted by the U.S. Geological Survey (USGS) in cooperation with Stanford University; the University of California, Santa Barbara; and Pennsylvania State University. The prevailing view among disease ecologists is that habitat destruction, climate change, and biodiversity loss will lead to an inexorable increase in the transmission of infectious diseases. Several case studies support this perspective: forest fragmentation can increase the prevalence of Lyme disease, dam construction facilitates the transmission of schistosomiasis, and loss of rodent species diversity may permit Hantavirus to thrive. These cases are noteworthy because they suggest common goals for conservation and human health. The comprehensive review of the effects of biodiversity on infectious diseases published in Ecology found several examples in which biodiversity loss seems likely to lead to an increased risk of disease for humans. However, these examples were eclipsed by the many instances in which disease risk is likely to decline as biodiversity is lost. An example of a decline in disease risk with loss of biodiversity is in the Yucatan Peninsula, Belize, and Guatemala, where residents have long had a nickname for the symptoms of cutaneous leishmaniasis—chiclero's ulcer—which is caused by the sandfly-vectored protozoan parasite Leishmania mexicana. Chicle is the latex produced by sapodilla trees, and chicleros are the men who spend months at a time in the forest collecting the latex. Other species of Leishmania have the same positive association with biodiversity: they primarily infect people who spend time in intact forests. This relationship is not uncommon among zoonotic diseases—those that pass from animals to humans. Wildlife hosts represent both habitat and resources for infectious disease agents; therefore, if biodiversity loss causes a reduction in host abundance, these disease agents may decline alongside their hosts. The idea that biodiversity can protect people against infectious diseases suggests that conservation and disease control go hand-in-hand. But this new research suggests that conservation initiatives might, in many cases, exacerbate human disease risk for as long as humans continue to interact with, live near, and utilize wild habitats and species. Armed with this knowledge, officials charged with improving public health or managing wildlife can design appropriate interventions to offset these collateral impacts of conservation on public health. This study was funded by a National Science Foundation Graduate Research Fellowship, an Alyce B. and Henry J. Ramey, Jr. Stanford Graduate Fellowship, the Italian Ministry of Research (PRIN2008), an NSF–NIH Ecology and Evolution of Infectious Diseases Program grant (OCE-1115965), the NIH Research and Policy for Infectious Disease Dynamics (RAPIDD) Program, and the USGS Status and Trends Program. Does biodiversity protect humans against infectious disease? : Ecology, 2014, v. 95, no. 4, p. 817-832, doi:10.1890/13-1041.1.